Dallas Fair Park 9 - Fair Park Esplanade. 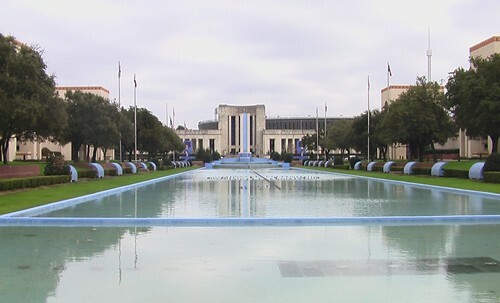 Located behind Frank P. Holland Court, the Fair Park Esplanade refers to a 700-foot reflecting pool situated between the Centennial Building and Automobile Building with a sidewalk on both sides. It has a left pylon decorated with a bas-relief of a pegasus at the front and a pylon adorned with a bas-relief of a siren on the right. In front of each rectangular structure, a fountain decorated with a shell design sprouts water into the pool. At the other end, a tall monolith with a small fountain has two human statues standing next to it. Between the two extremities is a collection of 272 water jets capable of spraying one hundred feet into the air. The jets work together to perform a dancing waters show every thirty minutes. During special events, they are accompanied by music and special lighting around the pool. Lasers and pyrotechnics join the shows during the nightly performances at the state fair. 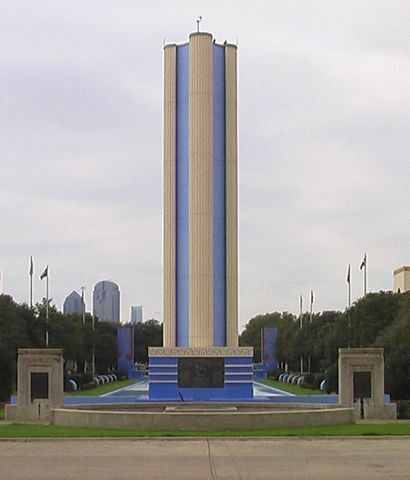 The Fair Park Esplanade was built specifically for the centennial exposition. 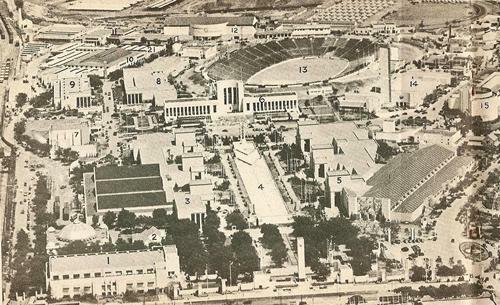 Unfortunately, many of the features mysteriously disappeared over the years or deteriorated with the passage of time. Efforts to restore the esplanade to its former glory began in 2008, funded through a bond election which took place two years later. The project's cost exceeded thirteen million dollars, which was the price of installing the dancing fountains. Workers added benches, landscaping, scoop lights, the monolith, and the pegasus pylon. David Newton recreated the two human statues named Tenor and Contralto, representing a male and female athlete respectively. No one knows what happened to the originals. They simply vanished. The statues were the work of Lawrence Tenney Stevens, one of the main artists who contributed to the centennial celebration. Lawrence Stevens spent his early life in Massachusetts, where he developed a love for sculpting and increased his skills throughout his school years. After graduating, he attended the Boston Museum School before volunteering for World War I. He returned from the war and managed to complete his education while spending time at the Louis Comfort Tiffany Foundation. In 1922, he won an art contest that rewarded him with a fellowship to study sculpture at the American Academy in Rome. After his return from Italy, Stevens decided to use his artistic skills to glorify the American West and provoke patriotism. He started in New York, but moved to South California. However, he spent his summers in Wyoming, where he focused on sculpting figures identified with the Old West such as ranchers, cowboys, farmers, and broncos using an assortment of clay, bronze, marble, and other materials. Lawrence's extensive artwork gained lots of attention, resulting in his commission for the exposition.